Whether you’re building a hot rod or custom car from scratch, planning on racing, or just want to add more juice to the vehicle you already have, if you’re a Ford enthusiast, you’ll want to check out the new line-up of crate engines at FRPP. The blue oval gang have added several new engines this year, from tiny to large. Ford’s small block V-8 has been around for a long time. Their current pushrod engines come in a range of sizes from 302 to 427 cubic inches, putting out 340 to 600 horsepower. Among them is the Z363 500 HP pushrod crate engine. It’s designed to replace the popular Z347, and offers 50 hp more. Innards include a forged crankshaft and I-beam connecting rods, a high-performance oiling system, and floating piston pins. It’s based on the BOSS 302 block, and will fit most vehicles with an 8.2-inch deck height that were originally equipped with a 289 or 302 block. Ford says the Z363 works on both the street and the track and is also available as a short block. 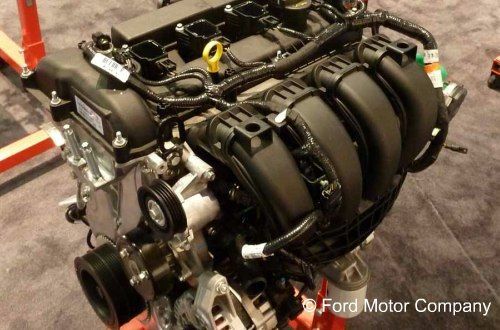 Ford’s also offering three new crate engines in its “Aluminator” series, based on the 5.0 Mustang GT’s 4-valve V-8. The 5.0 Aluminator NA is a naturally aspirated bolt-in for the 2011-12 Mustang GT and can be used in street rods or restorations in conjunction with Ford’s 5.0 litre engine controls pack. The 5.0 Aluminator SC has a 32-valve DOHC V-8 with a 9.5: 1 compression ratio. Then there’s the 5.0 Coyote ‘Sealed’ racing engine. It has the same specs as the 5.0 V-8 in the production Mustang GT, and is sealed to prevent tampering with the engine internals. The National Mustang Racer’s Association will be using them in a new racing class called Coyote Stock. If you’re looking for something smaller, you might be interested in the new I-4 offerings. These are based on a naturally aspirated 2.0 liter four-cylinder meant to work in Ford’s B and C segment cars. The initial product will be a direct injection engine with independent variable valve timing. Later engines will include such features as turbocharging and EcoBoost. They’ll all come as plug-and-play kits and will produce between 160 to 175 hp from a 122 cubic inch engine.